Over the past two years, our office has been working to address a concern brought forward to us by the community regarding Bayview Friendship Park. There was a request from the community to remove the sand around the playground equipment since it was attracting cat feces. In addition, there were community concerns about the stairway access from Hilda being closed during the winter months, and the overall accessibility of the park. The City was able to secure Strategic Initiative Funds to remove the sand and put in woodchips, as well as to eliminate the stairway entrance from Hilda, and to create accessible pathways around the park. In order to complete this scope of work, since it involves digging into the soil, an environmental study was done and it was determined that the soil needs to be remediated. This is not uncommon in our urban parks. Reid Park is currently undergoing environmental remediation, and Laroche Park will undergo the same when it begins its redevelopment. The environmental remediation department was able to secure funds to complete the remediation at Bayview Friendship, but those funds need to be used by the end of 2018. There were initial issue with the budget. 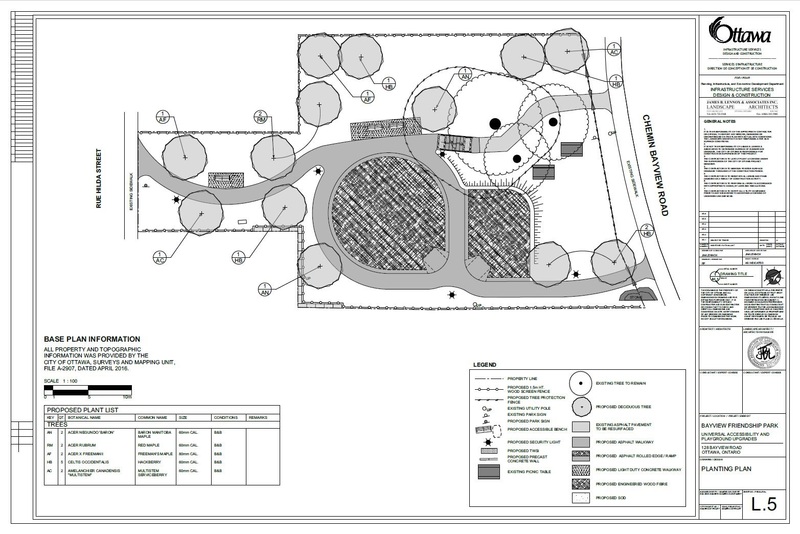 Initial estimates for the work in the park were coming up over what was available via the Strategic Initiative Funds. There was lots of debate about scaling back aspects of the project, but since a lot of work had already been done to date, everyone was determined to try to move forward with the initial plan – accessible surfacing for the playground, making the park accessible by realigning the pathways from Hilda to Bayview. Staff took that project and put it out to tender to see what the bids would come back as, to get a better sense of the budget issues. The bids came back over budget. However various City departments worked to fill the funding gap, and we happy to say that as of last week, the project is fully funded and ready to move forward. Our office and City staff met with neighbours on January 30, 2017 to discuss the project. It was discussed at this time that this is not a full park redevelopment, and the scope of the project is limited. There will be some impacts to the existing trees, and residents expressed wanting to have input on where the new trees will be consulted, so that will still occur. As more concrete details become available, our office will be working with the project team to disseminate this information to the community. We will be including details of the project’s scope, information about the environmental remediation aspect, and tentative timelines. It is anticipated that this work will be underway by early October. We’ve attached the concept plan, but it is not exact, as the tree placements may change depending on the community’s desires. There will also be a City website for this project for residents to stay up to date on the project’s status. There will be more information shortly, but in the meantime please don't hesiate to reach out to our office with any questions.